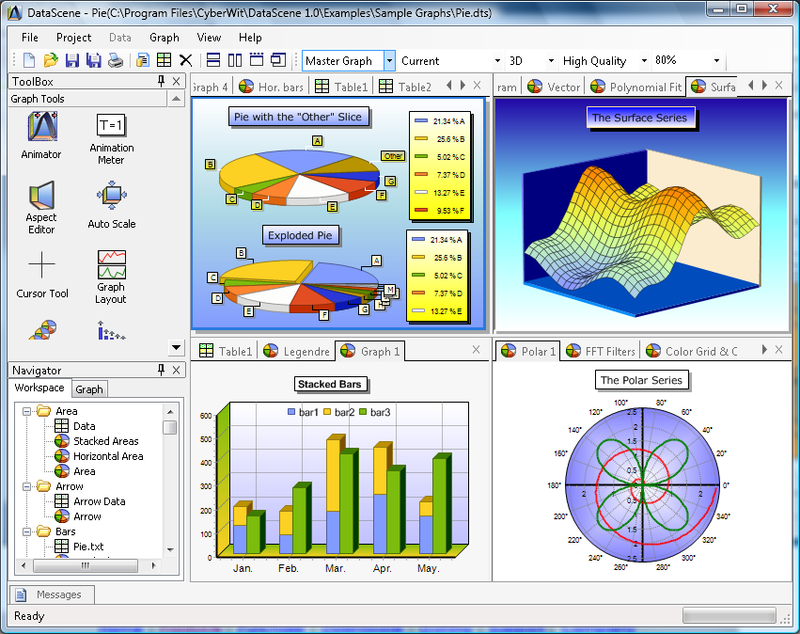 DataScene Express is a data graphing software package. It allows the user to easily plot brilliant 2D & 3D graphs (Area, Bar, Donut, Pie, Line, Surface, Polar, Histogram, Gantt, etc) with scientific, financial, and statistical data, to manipulate, print, and export high quality graphs. It supports a wide variety of highly customizable graphical elements (transparency, gradient, various brushes, textures, shadow, etc) and is an ideal tool for scientific graphing and office uses. Please check cyber-wit DataScene_FeatureMatrix.html for the feature matrix of different Editions of DatScene. * Plotting 39 types of graphs (Area, Bar, Pie, Line, Surface, Polar, and more) with brilliant graph quality. * Rich text graph annotations with a What You See Is What You Get (WYSIWYG) editor. * Importing data from MS Excel, various text formats (any delimiters, CSV, and fixed-width columns), ODF spreadsheets, and MS Access databases. System requirements: 1 GHz CPU, 512 MB RAM, 100 MB free disk space, 32 MB graphics card. Added date and number formats selection in the Program Options dialog box; bug fixing for the Gantt series.